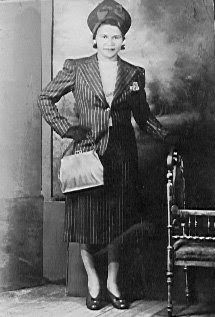 Irene Keitt in the 1940's. Most of the portraits are taken by Cecil Kelsey, who was a family member, and the first black photographer in Savannah, Ga.
Irene Sapp Keitt grew up in Millen,Jenkins County, Georgia with her parents and three siblings, she was the third born of the four. She moved to Savannah at the age of 17 to stay with her Aunt Ada, (whom I have not found any record of), to finish her education. Yes she did get her cosmetology license and built a shop onto the last house she bought in the neighborhood, 1101 East Bolton Street. She went on to own several businesses, a convenient store, a cab company, East Side Cab Co.,a gas station, an orange grove in Florida and pecan orchard in Millen. She owned property from Deland, Florida to Victorville, California. She was from a family of property owners, so some of the property far from her home was passed down to her from the Sapp side of her family. I learned a great deal about business from my grandmother and I did not even realize that she was teaching me anything other than how to work. It was not until later in my life that I realized how much I actually learned from her. She was a treasure and I am grateful for her passing along that desire to own something. Wow, Grandma was a Diva even back in the day. Tonya Thanks for posting this web site, I know you have wanted to do this for a long time. Good work and keep following your heart. You are bound to find happiness.